White House testing Samsung, LG phones, may dump BlackBerry? | BlackBerry Blast! BlackBerry Blast! > News > White House testing Samsung, LG phones, may dump BlackBerry? White House testing Samsung, LG phones, may dump BlackBerry? According to The Wall Street Journal, the White House is currently testing phones from Samsung and LG, threatening one of BlackBerry's last strongholds. BlackBerry has historically been known for security. When President Obama came into office he famously convinced the Secret Service to allow him to continue to use his BlackBerry. The White House has admitted they are currently testing other mobile phones that could potentially replace BlackBerrys used at the White House. "We can confirm that the White House Communications Agency, consistent with the rest of the Department of Defense, is piloting and using a variety of mobile devices," a Defense Department spokesman said. He declined to comment on the devices in the pilot test or in use at the White House. 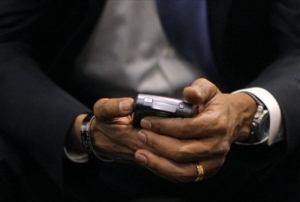 If a switch is made, it does not necessarily mean that President Obama will dump his BlackBerry.